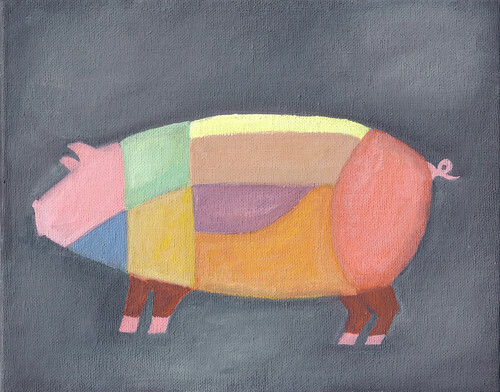 Colorful pig butchery chart, to compliment the colorful beef butchery chart. So, yeah, it's been a little quiet around here lately. But there's a good reason. In addition to a bunch of travel in May, I've been busy getting ready for my first ever art and craft fair, IndieMart in San Francisco, coming up this Sunday! It's been exciting, but busy, hence the lack of daily postings. There are some completely awesome things afoot here at MEAT SECTIONS headquarters, to be unveiled on Sunday. If you're in the SF area, come on by to say hello!